Why are my search engine results displaying header or category information? 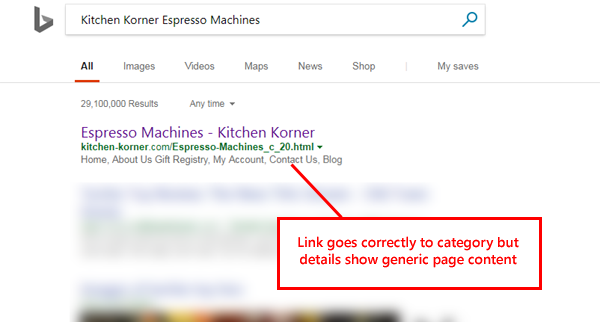 When performing a search on Google or Bing for a specific store category, you are seeing generic content information rather than details about the page. In the absence of a meta description, Google & Bing bots will read the page and display any relevant text in relation to the search performed. Most commonly, they will use snippets written in the page content. In the event that they do not find content, Google and Bing bots will display the category text. This happens because something needs to display on the search page besides just the store name and page title. Adding meta tags to your home page, category/subcategory pages, product pages, and blog pages will change the way these pages display on the search results pages. Best practices show that the meta titles and descriptions should be relevant and specific to the particular page. This will help to increase your keyword ranks overall. Meta tag titles should be no longer than 70 characters long. Meta descriptions should be no longer than 160 characters and no less than 135. You can use the tag wizard within the SEO section on categories and Meta Tag tab on products.